The Kavadi is a lengthy ecstatic trance-inducing dance ritual done while enduring some form of physical hardship. Generally, the hardship involves carrying heavy weights up a steep hill. The form of kavadi that is of most interest to the body modification world is where a frame is held (supported by the shoulders and/or hips) through which long weighted skewers are passed, which are then pierced into the skin of the back and chest. 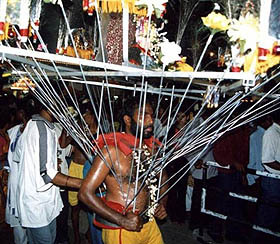 To take or bear Kavadi is a Hindu ritual normally performed during the Thaipusam festival. This page was last modified on 30 June 2006, at 04:23.